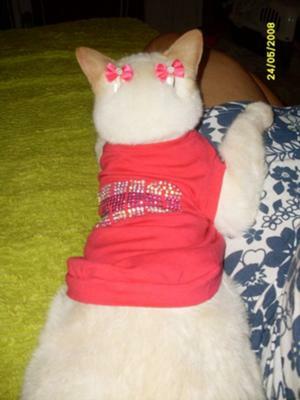 A lovely happy-ever-after story about this pretty Red Point Siamese 'street cat'. First, I'm very sorry for my bad English, I'm Brazilian and I'll try to tell you about my cat. Her name is Dara. I met Dara living on the street near my apartment every day when I went to the dentist. She was always in the same place, sitting in front the Jockey Club of Brazil. The first time when I saw her, I feel her calling me to help, to take her. By the third time, I was really in love with her and I take her to live in my home. Past around four years living together and Dara is my passion, I and all my family love her very much. 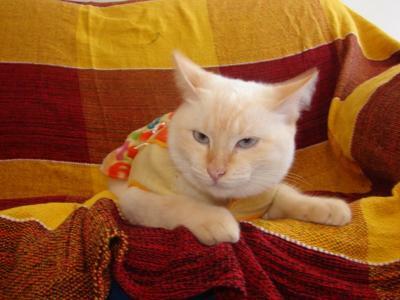 This cat is our happiness, she is a Red point Siamese but I only found this out when she was neutered. I think Dara lived with another family before me, cause she have too much education for a street's cat, but for some reason, they put her out. Fortunately Dara is very fine now, and very happy too, so this is my cat and this is our story. Thank you Adriana for your heart-warming story. Dara is lovely and I'm very pleased she's found a loving, happy home with you and your family. I do think cats are very telepathic and will somehow find their 'right people', so I can quite understand that you felt her calling out to you to help her. I'm just glad she was successful! There's no need to apologize for your English, it's much better than my Portuguese. Dara is LINDA! I am so glad you took her in and gave her a home, and a happy life! I think you deserve each other! Much love and beijinhos de Amarante em Portugal! Just before Mother's Day I found my Bella at a local shelter. She was a nine-month-old orphan, sweet and loving and happy to have a home. I looked into her eyes and fell in love. 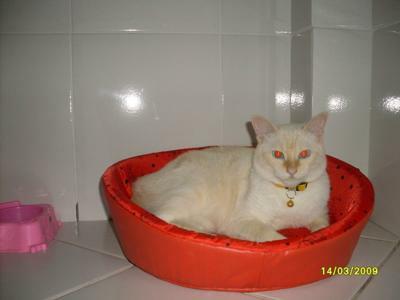 She was in the pound, I did not know that that she was a Siamese, she was simply Bella, my lovely. 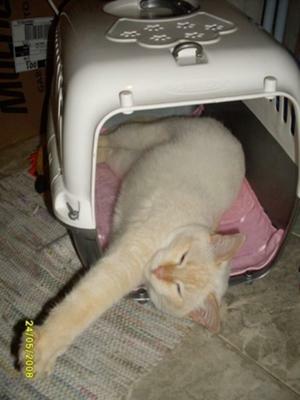 When I went to get her after the waiting period they let me know that I had a Red Point Siamese. What I really know is that Bella is sweet, loving and purrs to beat the band. She lifts my spirits and loves to cuddle. She is simply wonderful. Hello, first of all let me say thank you for saving this beautiful creature. This says a lot of what type of person you are. You are a wonderful and loving person to help this kitty. You will receive lots of blessings from the Lord. May he bless you, Dara, and all your family for opening your heart and your home. I have a Red Point Siamese named Mew Mew and he was 15 this October 10. Very sophisticated, but when he was younger we called him the Great White Hunter. He was afraid of nothing out there in the yard. He loves the outside just like his master and has slept in my bed for the last 14 yrs but this past year another cat has taken his place and he just can't share my bed with Sylvester, so he opted to leave the bed. Once in a while though, when the house gets really cold at night he will crawl back under the covers.